A new study by researchers at Washington State University, Spokane, found that while moms often use high-pitched tones and varied cadences with babies and toddlers, dads play it straight, speaking to kids as if they were adults. That’s according to a new study by researchers at Washington State University, Spokane, who found that while mothers often use high-pitched tones and varied cadences to communicate with their babies and toddlers, fathers play it straight, speaking to their little ones as if they were adults. VanDam based his findings on intensive study of 11 families with toddlers about 2½ years old. They’re among a larger pool of 120 families who have provided more than 2,000 days of data for analysis. Using a newly developed voice-recognition device tucked into a toddler’s T-shirt, he recorded each parent and child duo for about 13.5 hours and then analyzed the results. It’s the first study to examine fathers’ verbal interactions in a real-world setting using automatic data processing, said VanDam, who presented his results Tuesday at a meeting of the Acoustical Society of America in Pittsburgh, Pa.
VanDam and his team were looking for signs of what’s been dubbed “motherese,” the kind of sing-song baby talk long associated with communication between moms and their young children. In an era of shifting parental roles, the researchers wondered whether modern fathers modified their speech in the same way that mothers do. 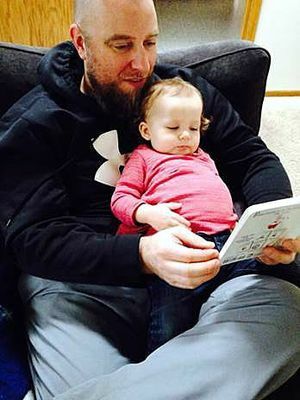 Although motherese is believed to be a bonding tool, a kind of communication that’s particularly engaging to young children, the fathers’ style is likely equally important, he said. That conclusion squares with what’s already known about early parent-child communication, said Tonya Bergeson-Dana, assistant professor at Indiana University Medical School, which runs the Babytalk Research center. “Even in singing to babies, moms will sing ‘Twinkle, Twinkle,’ and ‘ABC’ and dads will sing rock songs,” she said. VanDam detected some other differences as well in the ways that moms and dads communicate with their kids. Together, both modes of communication are vital to the child, he added. “Different parents, different people play different roles in developing children’s lives,” he said.